During the hacking work in 1999 in the Church of Santa Maria del Pi, a pair of kestrels (Falco tinnunculus) nesting in the same bell tower brought food both to their chicks and the peregrine chicks inside the nest box. They almost always brought swifts (Apus apus) and house sparrows (Passer domesticus ). When the young peregrines left the nest box, they lived together with the young kestrels and could often be seen perched together. Update The person in charge of the programme had looked for suitable sites in the year in question, but hadn’t realised this one had kestrels nesting “next door”. 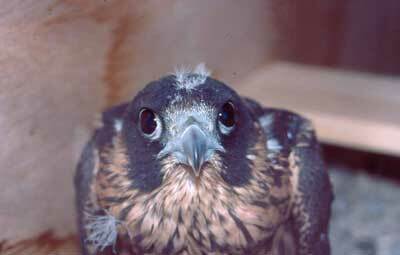 When their own chicks had fledged – which was early, before the peregrines- the adult kestrels heard the peregrines and started to feed them – but they couldn’t see them as they were in a box. They dropped headless swifts and sparrows through the letterbox. They also continued to feed their young, now-flying birds. When the peregrines emerged both species seem to have got on fine, and were frequently seen perching together. The next year they repeated the hacking in the same site, but on this occasion the kestrels hatched and fledged later than the peregrines, and the adult kestrels did not feed the young peregrines. This phenomenon is somewhat surprising if we consider that both kestrels and peregrines are highly territorial species which zealously and aggressively protect their offspring. 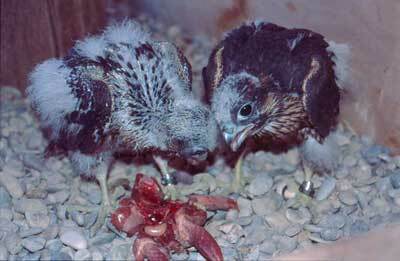 Moreover, peregrines will occasionally capture and eat kestrels.